Somehow the day ran out of time far too quickly today, but I did have a chance to post my first ever album review for The Record Room. Please click over there if you would like a review of Kinnie Starr's album Anything (plus mp3's!) or if you would like to check out the consistently fine discussions of music, new or old or full of gossip. Congratulations on your first post. I felt kind of bad because I didn't care for her songs. Maybe three songs is not enough to judge but I don't think Kinnie is going to find a space on my shelf. Don't feel badly, Toccata! Although that is very sweet of you. It would be a weird world if we all liked the same thing. Maybe you'll enjoy the music from the next review more (there's actually another western Canadian that I want to highlight). By the way I do love that you are highlighting Canadians! I know you won't be able to all the time but I think it's great when you can. Great review Barbara and of course, I wouldn't have expected anything less. I liked the songs you posted but really appreciated what you said and some of your observations. That cat picture IS freaky. Wow. Enjoyed your review Barb. I especially like the 'La te La La' (is that the right name?) song. I appreciated all the background vocals, etc. From what I heard, I think your rating of a 7 is apt. Thanks, Toccata. I'm certainly planning to review other musicians as well, but whenever I can I like to talk about Canadian music. That's really sweet of you to say, Dale. It just struck me as so odd that so few First Nations musicians are in the scene (except for maybe hiphop and the more traditional genres). Love that cat picture, Allison! I thought you would like that song - aren't the handclaps great? 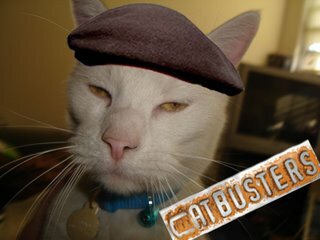 Haha, I love those myth busters guys :) I really liked that poppy song of Kinnie's it made me dance around. That picture's hilarious Barbara! Too funny...even down to the look on the cat's face! MythBusters is great, Mel. I wish I had time to watch it more often. I put La Le La La on a workout cd, it does make you want to move (as do the handclaps). I know, Karen, isn't the expression on that cat's face freaky? Far too anthropomorphic for my liking! You know what one I'm been loving running to lately, Mel? Also has handclaps? Belle and Sebastian's The Boy with the Arab Strap. And the Pogues are usually always good - If I Should Fall From Grace with God is a dandy. Let me know if you need these put onto mydatabus. 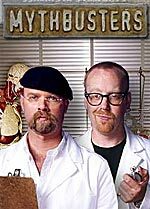 Love the Myth Busters, cool show. I'm on my way to check out the review and listen to some tunes. Does that cat hate Photoshop? Consider them yours, Mel. I've incorporated them into my newest post, sneaky multi-tasker that I am. I LOVE the handclaps on Boy with the Arab Strap! Mythbusters is one of the best, Ocean! All cats hate Photoshop, JustA. It makes them look undignified and uncatlike.